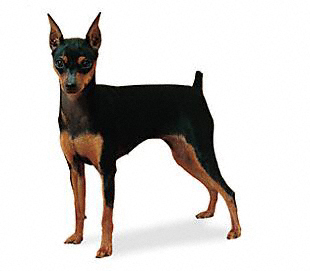 Commonly known as the “The King of the Toys” a second name for the Miniature Pinscher, this dog breed is full of energy, a very feisty and enthusiastic dog, this breed has a hunger to experience new places and surroundings. If this breed is allowed it can surprise you by its fast running and this small king of the toys can capture your heart. This dog breed is very faithful, attentive and enjoys playing. This breed needs proper socialization in its early days as they don't do well with people they don’t know. The Miniature Pincher are a small dog breed that enjoys with children and other pets if they are trained well.They need appropriate exercise because they are very curious and energetic. This breed of dogs is suggested for the household but only with those children who can respect them and be nice with them. This dog need proper training and a good trainer to handle it otherwise they may turn out to ill mannered and ill trained. This dog has very feisty traits which require energy and tolerance. They need proper attention towards them regarding their grooming. Regular cleaning down with a cloth on regular basis to remove loose and dead hair is required. This beautiful short Toy king does not need much protection for its coat. The color which is suggested for this breed are solid clear red, Black and Chocolate. This dog breed is most usually seen in Red, Black and Rust.Like other Toy breeds this dog is also very difficult to train for a house, regularity is important while training such kind of dog breeds, this little dog is a very good learner and can learn very quickly if proper training is provided. It is an energetic dog which requires regular exercise and it is good for apartment living but every day training and exercise can satisfy this breed's inquisitiveness a few steps of walk can be enough for this breed and it can make you feel very happy. Keeping a pet is not just a hobby that can be taken lightly, it is also a serious responsibility and one should always provide their pet with a healthy environment, love and care. Most dog breeds are prone to dog diseases and health related issues, most of these diseases can be treated early if diagnosed in time, as responsible pet owners it is your responsibility to keep an eye on your dog, if you notice any behavioral changes or physical problems that can indicate an underlying health problem with your pet, be sure to consult your veterinarian at the earliest and get your pet checked out to rule out any medical conditions. A healthy pet is a happy pet and a wonderful companion.